← Got my BMI going on… Now what? Your Body – the food processor! Here's a great example of a meal we would eat now to glorify God in our bodies. Trying new things isn't always easy with little ones, (or big ones for that matter!) 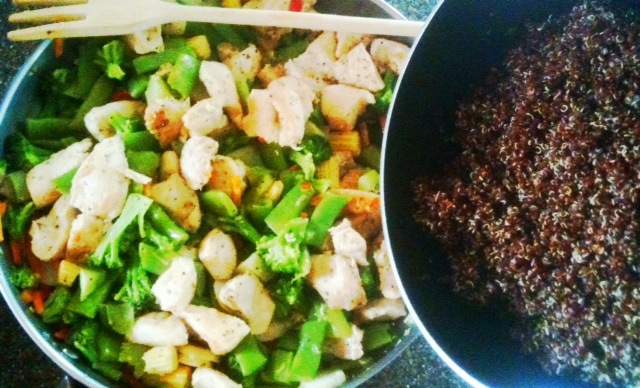 It's simply stir fry, and instead of rice - Organic Red Quinoa. It was a hit with (almost) everyone. and my blood sugar numbers would still be high! This was beyond frustrating for this black and white personality. God definitely “blessed me” with this to teach me a few lessons. Did you know that if you don’t get enough rest, your body is stressed and tries to fill that energy void with calories, particularly sugar? Ever wonder why your CRAVE junk when you’re tired? You may think a pop will fix it (guilty here! ), and it really is poor quality band-aid. Lack of sleep, being ill, or being stressed with environmental factors ALL affect the way your body processes foods. On the UP side… exercise helps decrease your stress, improve your health, AND helps you burn more calories in a day by increasing your heart rate and helping you build muscle! Before I had gestational diabetes, I was often reacting to what life was throwing me day-to-day. Over the years, I got into some really horrible eating trends while pregnant that carried into my “normal” postpartum life as well. When you have several small children, it’s difficult think some most days. So if you have children, or a stressful job, or a lot going on in your life – these are the times that are MOST important to make sure your body is being properly fed, because it’s already struggling. Seriously, I didn’t have time. What I mean was…. By my actions, I wasn’t MAKING the time. In 2005, I used to eat a big bowl (read: WAY beyond the serving size) of cereal for breakfast… my favorite that specific pregnancy was Cocoa Krispie’s. (I’m pretty sure there isn’t actual COCOA in those.) By mid-morning I had consumed a chocolate muffin, or maybe some pop tarts…and a pop or latte (hello 9 tablespoons of sugar!). At the time, this didn’t make sense to me, as to WHY. I had eaten all of that food! But the quality of food was …. not quality … in the least. My body had burned through that refined sugar… quickly – and there was no protein or fiber or anything of substance for it to draw lasting energy from at one of the most important parts of the day. The rest of my day wasn’t this poor, but I often skipped eating dinner altogether when doing a photo shoot, or perhaps I would have some ice cream or more cereal before bed. When I tally up the carbs and sugar in those days, I could go into a carb coma instantly. Not to mention what it was doing to my metabolism and blood sugars, going from too many calories and carbs to starvation, only to repeat the cycle AGAIN. This is why we need to be consuming things God created for consumption, and really be AWARE of what we’re doing to ourselves. It makes our temple a smooth running machine, and we can feel at our best. Honestly, neither did I … [the song “Slow Fade” comes to mind, by Casting Crowns]. This was for a short time – but it’s the worst of the worst in my life… and I share it with you as encouragement. Look at where I came from… and look at where God brought me today! Thank you God! All things are possible through Him. Enjoy the holiday, and some treats – but cut out what you can… things like white buns, rich desserts, and sugary drinks can be kept to a minimum… eat a little less and move a little more – every little bit does count. I’m anything but perfect, but I can bring my struggles before God daily, and ask Him to fill me with the strength to say no to things that aren’t good for me. Posted on June 22, 2011, in Uncategorized. Bookmark the permalink. 6 Comments. Very good!! What kind did you get, and what did your kids think? It was an organice white quinoa. My kids didn’t eat it, to many other choices. Everyone else ate it and was suprised how delicious it was! We love quinoa at our house, but not in a pure, quinoa + water format (kids anyway – I like it pretty much all ways). My kids like it to have some kind of herb/broth seasoning to it, or if the main ingredient is saucy (stir fry/spaghetti) then it is okay under the sauce. I’ve never tried the red before, though – I’ll have to hunt it down. 😉 I’m not a saucy gal myself – we skip most sauces – especially stir fry ones! I can see kids enjoying it in a broth though. Yum!